It must have been more than fifteen years ago when I saw Lacuna Coil live for the first and only time. It was a medium size gothic festival and the band had released either Unleashed Memories or Comalies. ‘Italian gothic metal’, was my thought, what could that be? Surely theatrical? Well, absolutely! I was awed by the performance of the band, the pleasure they played with and, yes, the Italian theatricality of it all. Listening to the albums, afterward, was a bit disappointing however, because although the music was fine, live the band gave it more body. 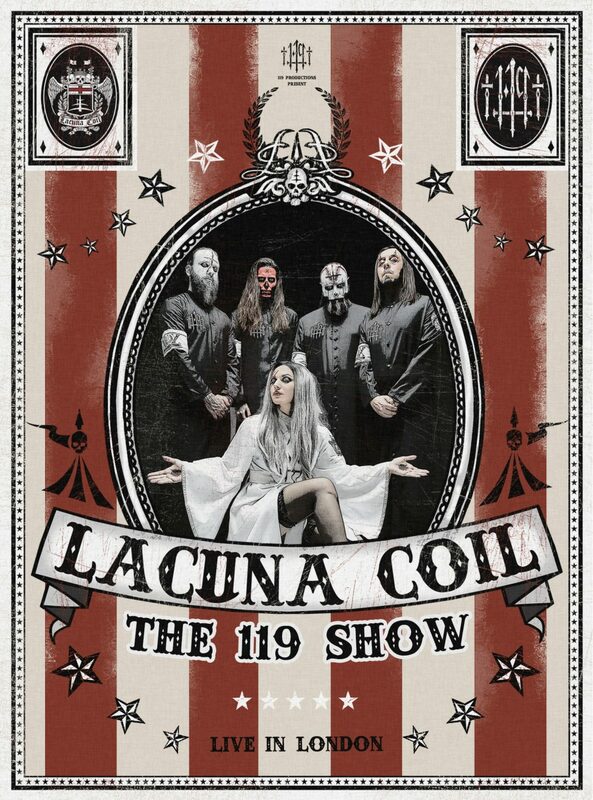 Now, celebrating their 20 years in music, Lacuna Coil performs in a full London ..??? and release it as CD and DVD, hence making their second live album. The opening of the DVD makes clear my ‘theatrical’ idea still stands. More so, the Italians chose to make a circus setting of the stage. Simply with huge curtains hung in the right way and a tent at the back, you feel like being in the circus pavilion and the show is ready to begin… With nice shots of fans standing in line and making ready for the concert, the DVD gets you in the right mood. The production is a good one, yet maybe a bit too smooth. When the first song starts, you only hear the audience at the start and at the end, probably all sound from the audience is faded away. A choice that has two sides. On the one hand it makes the CD very listenable: no yells or whistles disturbing the songs, purely good quality music. On the other hand, watching the DVD, it almost feels like the audience is not allowed to be there during the music, I like to feel like being part of the crowd when I see a live DVD, here I merely feel like a spectator. This said, the quality of the recordings and performance is superb. To me it is like listening to version 2.0’s of especially the older songs, that sound more alive then on the record. Other performers work better, clowns, trapeze, pyro, you name them! During an intermezzo, followed by the ballad Falling, the show is full blown cabaret. I more and more appreciate the eye for details that the band portrays here. Then the appearance of the band themselves. By facepainting all members with variations of the skull-theme, except both vocalists, they seem to matter less then central figures Christina and Andrea. Maybe they choose this because, together with Marco (bass), they are the oldest members of the band? When the clowns come…the show is almost over…yet after their hypnotizingly weird performance, the band has three more songs for the audience. In all honesty, I never thought their version of Joy Divisions Enjoy the Silence was a necessity, making it into a ‘sing-along’ goes a bit too far for me. With Nothing Stands in Our Way as last song, the band makes clear that there is nothing to stop them from going on for at least another ten years! Here you can also read our review of Lacuna Coil’s Delirium.